Leaky pipes are not religious | Help! I live with my Italian mother in law! I called this photo ‘holy pipe’ although there is nothing religious about it at all, it just has some very large holes in it and I am a bit challenged with proper adjectives at 7:00 a.m. So, why the photo anyways? Well along with inheriting the Aunt’s half of the house we have also inherited her ‘holy pipes’ too. With little to no water pressure it was pretty obvious we had a serious leak somewhere. How long this problem has existed is anyone’s guess and I shudder to think what the farmer’s water bill was monthly. Anyways, it took a few days and a noisy jack hammer to locate the culprit. Look at this rusted out pipe. To think that I have been drinking the tap water too! Strong case here to buy bottled water. Thankfully, we found the problem quickly and avoided a huge water bill in the future. Now whose going to come over and clean up this mess? 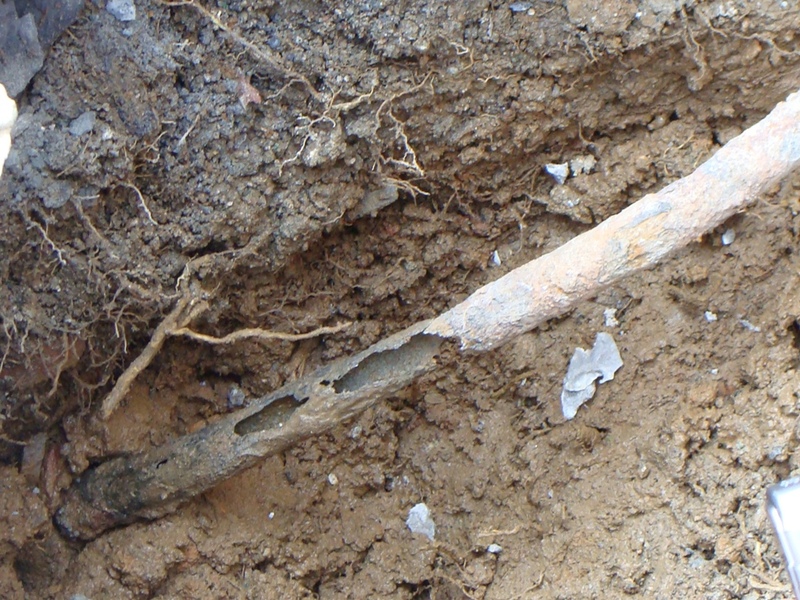 This entry was posted in Italian Culture and tagged home renovation, plumbing, rusty pipe, water. Bookmark the permalink.